Click on any of the below topics to view detail about that topic. Visit the Focus in Pix download page and click on the button matching your computer’s operating system to download the initial installer. For additional help with installation, visit either the MAC or PC installation instruction pages. Below is a video showing how to install Focus in Pix on a Mac. You can make Photo Books, Greeting Cards, Posters and Calendars and much more in Focus in Pix! We are constantly adding and updating our products. Once you install your software, it will only come with a few products and they may be outdated. We highly recommend that you check for updates before starting any new project. To update your software, start Focus in PIx and then click on “Create a New Project”. Click on the “Check for Updates” button located in the lower left corner of the dialog box. A list of available updates will show. Click on the individual products you are interested in. Please note that some projects such as posters and photo books may take extra time to download depending on the product type and your internet connection. Please only choose 1 or 2 products at a time to download. You may also see items such as Backgrounds, Scrapbook items, Frames and Masks in the update list. Click on the main categories for these items to get all of them. We recommend only clicking on one of these main categories at a time, per update session. If you are new to using Focus in Pix, we suggest watching our Introductory Tutorial (below). Please visit our tutorial page for helpful videos showing you how to install and use Focus in Pix. Look for more tutorials coming soon on our tutorials page. In Focus in Pix, most designs show a red guide line on the page which shows you where your design will be cut. It is a safe practice to keep important, critical items at least 1/8 of an inch or more inside this red guide line. This would include pictures and text that are not meant to bleed off of the page. For example, if you want to put a photograph on your page where the background would create a border around your photo, allow at least 1/8 of an inch or more of background around the photo. 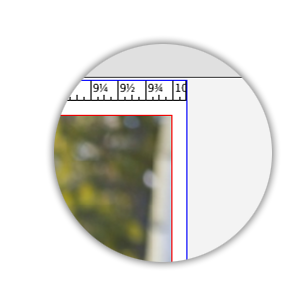 If a red guide line does not show on your page, please position critical items so they are at least 1/8″ or more inside the edge of the page. In many of the Focus in Pix designs, you may notice certain graphical elements will not move when you try to adjust their position on the page. To preserve many of our designs we have locked certain elements on the page. We feel that this will give most users the best results on their finished product(s). If you feel you are are an advanced user, you can unlock an item by right-clicking on the element and choosing “Unlock” from the right-click menu. After unlocking an item, it will move freely on the page to any position. Please be aware that when unlocking items in our designs, we ask that you adhere to keeping critical elements in the safe area on the page (see above item “Safe Area). For example, photographs and text should be kept at least 1/8” away from the red cut guideline if it shows on your project. 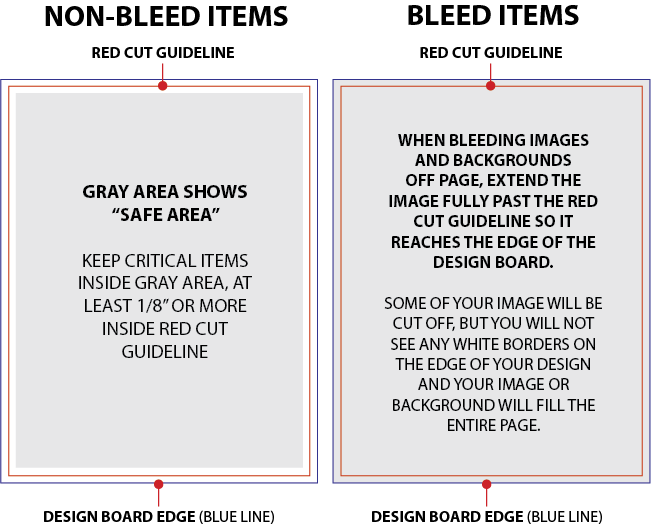 We also ask that photos that should bleed off the page bleed fully to the edge of the page past the red cut guideline. If you have any questions about locked items and safe area, please feel free to call us at 952-891-8707 between 8 am and 2 pm, or send us an email at production@focusinpix.com. From the top menu on your screen, choose Page > Insert to add more pages. This option will be grayed out if it is not available on the project you are working on (such as greeting cards and posters). You may only delete pages in sets of 2-page spreads when creating photo books. First, navigate to the 2-page spread you wish to delete so it shows on your page. Select from the top menu Page > Delete. A prompt will show asking you if you are sure you wish to delete the 2-page spread — click the “Yes” button to delete it. From the top menu on your screen, choose Page > Rearrange Pages… to bring up the Rearrange Pages dialog box. In this dialog box, you may either click and drag 2-page layout spreads to a different location, or use the arrow buttons on the side of the dialog box to move the spreads around. Please note that you will not be able to move individual pages or cover and back pages — only 2-page spreads. You can duplicate a 2-page spread of your photo book to save time with similar layouts. To duplicate a 2-page spread, navigate to the page you want to duplicate so it shows on the page. From the top menu, choose Page > Duplicate. A duplicate set of these pages will now be added to your book. If you have already imported your pictures and begun to organize your photos onto your pages, you may want to use the “Change Product” button located above your project page. After your book has been converted to the new theme, a dialog box will appear on your screen. It will prompt you to check each page as some graphics may shift and photo cropping will most likely need to be re-adjusted after the conversion. What types of image files can be imported into Focus in Pix? You can import JPG, TIFF and PNG images into Focus in Pix. Scans that are saved as JPG, TIFF and PNG can be imported into Focus in Pix. Before scanning your photo, use a dry, lint-free cloth to remove any unwanted dust or debris. Make sure your scanner bed glass is clean (refer to your scanner instruction manual when cleaning your scanner bed glass). Output Size Dimension: Before you scan your image, you should have some idea how large you want your final image to be on your project board. For example, if you are working on a poster project and the photo box you plan to put the scanned image into is 5 inches wide by 7 inches high, this will be the dimension you want to note down. 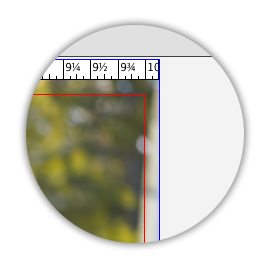 NOTE: You can find this dimension in Focus in Pix by selecting the photo box you want the image to go into, and then select the ruler icon (upper right of your screen). Dimensions for your photo box will be listed. If the dimensions for the photo box are not shown in inches, go to File > Preferences and change the units to “inches” by checking the “inches” check box. For the Resolution setting, enter a number between 200 and 300 DPI. Use 200 DPI if the image is cropped already and you do not plan to crop in on the photo image very much once it is in your layout. Use 300 or more DPI if you plan to crop in on the image once it is in your layout — or you may choose to crop your image using your scanner software. Scan the image entering the size and resolution settings noted above. Scans should be saved as JPG, TIFF or PNG files. When using compression, we recommend high settings for the best quality. Refer to your scanner software and hardware manual if necessary. We recommend that photos and other raster images be saved at 100% the final size on the page (including cropping) with a resolution setting of between 200-300 DPI (dots per inch). You can create custom colors for text and borders. 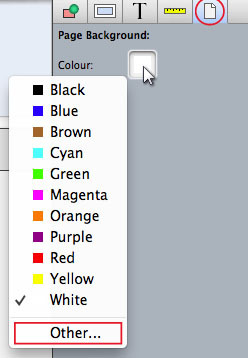 To alter the color for any of these items, you will first need to locate the “Colour” box for that item. Click on the square next to “Colour” to bring up a list of colors. Choose one of the pre-mixed colors shown, or choose “Other…” to mix a custom color. This will bring up your operating system’s color mixer. 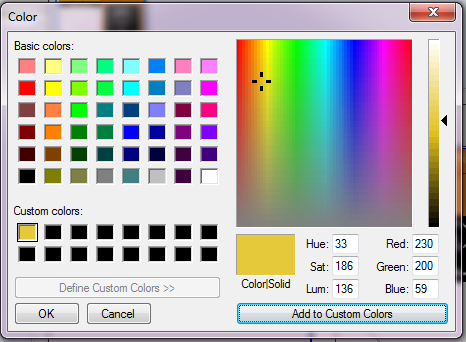 Play with the sliders and/or type in color values to create your own custom color. Use tabs at top or pull down menu to select color type. Second icon from left (resembles sliders) or pull down item “RGB Sliders” will bring up Red, Green, Blue colors. 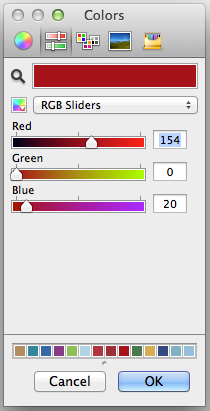 Type in Red Green Blue values or play with sliders to create your own custom color. 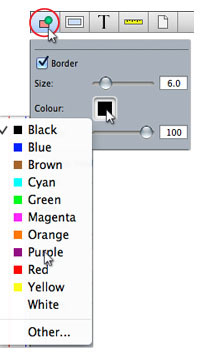 To save color, drag created color into little color thumbnails near bottom of dialog box. Click OK. Choose a pre-mixed “Basic Color” or click on “Define Custom Colors” button to expand this tool and mix your own custom color. Mix colors using sliders and/or mouse clicks, or by entering [Hue, Saturation, Luminosity] or [Red, Green, Blue] values in these fields. Click on “Add to Custom Colors” button. The color will now be saved in the empty square chosen before mixing your color. You can create a custom solid color background on any page or project. Note: You must delete any background images on the page for solid colors to appear. In the upper right corner of your Focus in Pix screen, click on the “Page Background” icon. This icon looks like a blank, white page. You can add your own custom background images to your Focus in Pix “Background” library as long as they are saved in the correct file format. Background images should be saved as RGB files as TIFF, JPG, JPEG, or PNG files. Depending on the output size of your Focus in Pix project, your image should be saved at the full size of the page, with minimum resolution of 150 DPI to maximum resolution of 300 DPI. Click on the Backgrounds tab on the lower portion of your screen to show your backgrounds palette window. On the lower right corner of your screen, click on the button that looks like a “gear” to bring up the Backgrounds pull-down menu. Select “Add…” from the drop-down menu. A window will show allowing you to browse your computer for your background image file. Once you have found your file, select it; press the “Open” button. You can add any clip art (known as scrapbook items) to your Focus in Pix “Scrapbook” library. Scrapbook items should be saved as RGB files as TIFF, JPG, JPEG, or PNG files. Depending on the output size of your Focus in Pix project, your image should be saved at the full output size you intend it to be on the page, with minimum resolution of 200 DPI to maximum resolution of 300 DPI. Special note about scrapbook images: In most cases, scrapbook images look best when they are profiled or “clipped” so the background on your scrapbook item is transparent. To clip or mask out the background, the image will need to be manipulated and saved in PNG-supported vector or photo image editing software such as Photoshop, Illustrator, or Paintshop Pro. Once the background is removed and made transparent, it should then be saved as a transparent enabled PNG file. If done properly, the scrapbook item will be profiled on your project page. If your image is not “clipped,” your scrapbook image will appear and print with a background on your project page. Click on the Scrapbook tab on the lower portion of your screen to show your scrapbook palette window. On the lower right corner of your screen, click on the button that looks like a “gear” to bring up the Scrapbook pull-down menu. A window will show allowing you to browse your computer for your scrapbook image file. Once you have found your file, select it; press the “Open” button. Before starting your project, we strongly suggest finding all the pictures you plan to use and copy/paste them into one folder located on your computer. This streamlines the process greatly if you happen to run into unresolved technical problems while creating and/or ordering your project. Next to the plus sign in the “Pictures” palette, you will see a “gear” icon. Click this icon to organize your imported pictures. You can sort your photos by file name, file creation date, picture orientation, picture usage and rating. You may find Sort > By Picture Usage particularly helpful as this sort feature will show you with red burst icon on the picture thumbnail if it was used in your design. This icon will also show how many times the picture was used in your design with a number inside the icon. There are two ways to change the months in your 11″ x 8 1/2″ calendar, each requiring you to change each month or each page manually. Drag-and-drop the the appropriate Page Style month page onto the page to replace it. Continue to do this on each month page. Double-check your calendar pages to make sure each month is in the correct order. If you have already designed your pages, you might find it useful to change each month using the scrapbook images of the months. These are found in the Scrapbook tab near the bottom of your screen. To change a month on a page, scroll through the scrapbook items to find the correct month. Then drag-and-drop it onto the page in the area of the page where the month shows. Make sure that before dropping it into this area, you see a blue line around the area where you will be replacing the image before you drop it onto the page. This insures that the previous calendar image will be replaced with the new one. The large wall calendars are slightly different types of projects in comparison to the 11 x 8.5 flip calendar. When creating a wall calendar, it is necessary to import some of your pictures first. The software will build a default calendar style using your pictures, however you can edit your calendar once it is open to change where pictures are added and page layouts. Additionally, the calendar month text and date text can be changed to different fonts and colors if you like. When creating a wall calendar (11 x 17 or 12 x 25 1/2), it is necessary to import all or some of your pictures first. The software will build a default calendar style using these pictures, however you can add more pictures and edit your calendar once it is open to change where pictures are shown. You can also change the page layouts by dragging and dropping “Page Styles” onto any page. There are two different kinds of backgrounds. 1) Background Images and 2) Solid Background Colors. Background Images: We have added many background images into the “Backgrounds” library. Click on the “Backgrounds” tab near the bottom of your screen. Scroll through to find an image you would like to add to the background. Drag-and drop the background image onto the page background area. Solid Background Colors: Click on the “Page Background” tab found on the right of your screen (the icon looks like a blank piece of paper). Click on the color square to select or mix a color. (This will utilize your computer operating system’s color mixer.) Note: you must remove any background images assigned to the page in order to see a page background color. 11″ x 8 1/2″ Flip Calendar: The fonts used on the calendar month name and date cells cannot be edited. This is because we have created these calendars as images and imported them into the software. You can add custom text to any calendar cell, on top of the original calendar (see instructions below under topic, “Adding custom text to a specific calendar date”). Large Wall Calendars (11″ x 17″ and 12″ x 25 1/2″ wall calendars): You can change the font and text color on the calendar by clicking on the calendar edit button found right above the page. Sometimes adding a white box behind the calendar area, or choosing a different Page Style may work best with different backgrounds. With either calendar project, you will want to be mindful of using an appropriate text color against different background choices to achieve the best readability. You can add pages (months) to any calendar project. The 11″ x 17″ and 12″ x 25 1/2″ wall calendars can be customized up to 18 months. The 11 x 8 1/2 calendar can be customized to include up to 24 months. Adding months to the 11″ x 8.5″ calendar: This calendar is built differently than the wall calendar projects. The default calendar will open to include 12 months. This calendar can be customized to include up to 24 months at an additional cost (see calendar pricing for more information). Click on the “Scrapbook” tab near the bottom of your screen. Scroll completely to the right to find the item titled, “CUSTOM TEXT BOX”. Drag and drop the “CUSTOM TEXT BOX” onto the date box you wish the custom text to appear. Adjust position with mouse pointer (click and drag text box into place). Double-click on the custom text box that you placed on your page. A blinking cursor will appear when you are in “edit mode” within the text box. Click and drag over existing text to highlight it. Then type in custom text to replace existing text. Change font, text size, alignment and other attributes in the Text Attributes panel (look under the “T” icon on the right side of your screen). You must select / highlight the text before changing attributes. NOTE: You may find it useful to zoom into your page using the magnifying glass or “View” > “Maximum Zoom” from the top menu. When in “Maximum View” mode, you may need to use the scrollbar to locate the proper area on the page. To return to standard view, choose “View” > “Minimum View” from top menu. Zoom into the page and find position where picture and text box will be added. Drag and drop either “PIC WITH TEXT” or “PIC W/TEXT FADE” onto the date box you wish the custom picture and text to appear. This will add both a picture box and a text box to your page. Adjust position and size of newly added picture and text box using mouse pointer. (Note, not all cells on each calendar month are the same size, so adjusting each new picture box will be necessary. Drag a picture from “Pictures” tray into picture box. Take extra care to not drag the picture onto the calendar month image. To adjust cropping, double-click on filled picture box to access the crop tool. 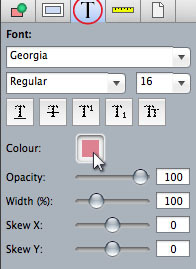 Double-click on the text box to highlight and change placement text in text box. Change font, text size, alignment and other attributes in the Text Attributes panel (look under the “T” icon on the right side of your screen). To return to standard view, choose “View” > “Minimum View” from top menu. When moving items around on the page, they may “snap” into position, sometimes overshooting where you want them to land on your design. For better control when moving items on the page, you may want to turn off the “snap” feature. To turn this feature off, go to your programs menu and select View > Grid > Snap Position. (To turn the snap feature off, there should not be a check mark next to this menu item. Select it to toggle it on or off.) Once this feature is turned off, you should notice that items are easier to move around on the page, and will land where you place them rather than snapping to the underlying grid. Be sure to click the preview button before sending your product in. Magnify your pages as needed to view small, fine details and their placement. Once you are finished making your project within the Focus in Pix software, you will begin the order process by clicking the shopping cart in the upper right corner of the screen (or choosing File > Order from the top menu in the program). This should prompt your system to open up your order details within your internet browser (i.e. “Microsoft Internet Explorer” or Mozilla Firefox, etc.). Within your internet browser, you will fill out the quantity and choose paper, mounting and shipping options (if available) and pay for your order. After your order is placed, the system will prompt you to go back into the Focus in Pix software and upload the artwork files for your order. If after following the instructions you still do not see the dialog box prompt, it is possible that this box is hidden behind your browser and Focus in Pix program. Try to minimize your internet browser (i.e. Microsoft Internet Explorer, Mozilla Firefox). If you still do not see this box, try to minimize the Focus in Pix software. If you still do not see the option to upload your artwork, please contact us at production@focusinpix.com. You can order your project again via the “My Account” feature. Go to www.focusinpix.com and click on “My Account” in the upper right corner. Enter your Login ID and password to log into your account. (Note: Login ID and Passwords are case-sensitive). Click on the “Previous Orders” icon to bring up a list of all past Focus in Pix orders. Locate the project you wish to reorder in the list. (You may need to use the “Preview” link next to the order name review a preview image of each order.) Click on “Reorder” to place another order. You will be asked to log into your account again, submit order details and pay with your credit card. You will not need to upload your order again as we already have a copy of your files from your previous order. You can share your book with your family and friends allowing them to order your exact project for their very own. You can currently share your book via Facebook or email. Your friends will pay for their order via their own credit card and Focus in Pix account which they will be required to make upon ordering a copy of your project. First access your account via the “My Account” feature. Go to www.focusinpix.com and click on “My Account” in the upper right corner. Enter your Login ID and password to log into your account. (Note: Login ID and Passwords are case-sensitive). A dialog box will appear. Under “How would you like to share?” click on either the social networking icon (1st icon) or the email (envelope) icon. If you wish for this item to be protected with password protection (your friends will need to enter a password to access it), assign password in the password field. Confirm the password by typing it in again. (Be sure you provide the password to those you plan to share this with so they can access it!) If you do not wish for password protection, leave the passwords fields blank. If you selected Email (envelope) icon, click on the “Share by Email” button near the bottom. Fill in the Message Title, Email Addresses (separate each address with comma) and Message Text fields. Press the “Share” button. Your friends can now view your book and reorder if they wish. They will be required to open a new account to order your project. There are legal concerns involved in using photographs and other tangible works. The reproduction of photographs or other tangible works require the written consent of the author (i.e.artist, photographer, writer, composer). Professional photographers and authors automatically obtain copyright on all of their work and retain those rights unless transferred in writing. Ownership or possession of a copy of a professionally shot image does not give the possessor the right to reproduce the work without written consent of the author/photographer. Therefore, a customer must provide written permission from the photographer/owner for the use of a photo or logo in any project involving duplication of that image or photograph. To avoid any interruption in your order being processed, please provide us with a copy of the release the photographer provided to you. This will either be a physical document, or it will be a file stored on CD/media along with your photographs. If you do not find a release with your package, please contact the photographer to make sure you can duplicate the photographs. If he/she approves, they will need to provide written documentation giving you permission to duplicate the image(s) and a copy of this should be provided to us. You can also ask your photographer to fill out our standard copyright release form. Copyright releases can be forwarded to us via email at teresa@focusinpix.com, or via fax (952-891-8737). To ensure that your release is applied to your order, please reference your order number and last name when providing copyright releases. If you do not find the topic you are looking for on this page, please use the below links for more helpful information on our website.